← W.5_Lilly Wasitova_ How to Get Competent Resources? The increasing sand deposition in the production tanks will cause shortage in overall treating capacities. The project is to remove the sands accumulated in the bottom of Tanks of Oil Treating Plant (OTP), while still being able to manage the sands coming out from those tanks to meet the requirements for further management methods, e.g., disposal or others. Providing more settling time for crude oil dehydration process. Reducing the sand deposited at the bottom of the Tanks. Providing higher oil and water quality from tanks. The production fluid from reservoir with high content of sand will be accumulated in the tanks. Sludge in the tanks will make lower tank capacity. At the end, Oil and Water Treating Plant will have bad performance. Develop selection criteria for the Tanks to be desludged. Develop tank desludging priority to help define the schedule and work sequences during the project execution. Evaluate and select the best acceptable tank desludging technology based on the acceptance criteria agreed. Develop and implement the efficient contract strategy for tank desludging work. Monitor the contract implementation benchmarked with the forecasted schedule and cost. Since this tank cleaning project directly links to other initiatives such as tank inspection, sand pans modification, tank repair and others, close coordination among those different projects is essential to ensure the overall project success. Project Team developed an influence diagram to help understand and identify key important variables and how their relationship toward achieving the success in addressing the opportunity identified. From this diagram, the final value measured is the NPV, which directly links to the Treating Cost (consisting of Oil Treating Plant/OTP and Water Treating Plant/WTP). Project team also identified that tank cleaning technology and type of tank included in the scope are key decisions to be made, which both will drive the schedule and the cost for doing the tank cleaning. Ensure Safe & Incident Free Operations by allowing tank inspection program in place and make the repair work, if required, is possible. Help reduce the operating cost of crude oil dehydration process due to the improvement in tank performance as the results of sand pans modification work can be carried out. Have better flexibility in terms of GS’s treating volume so that surface facility constraints can be minimize, e.g., fluid dispatching issues. Focus on tank cleaning work and combination with sludge processing/treatment. Focus only on OTP tanks only (FWKO Tanks, Wash Tanks and Shipping Tanks). 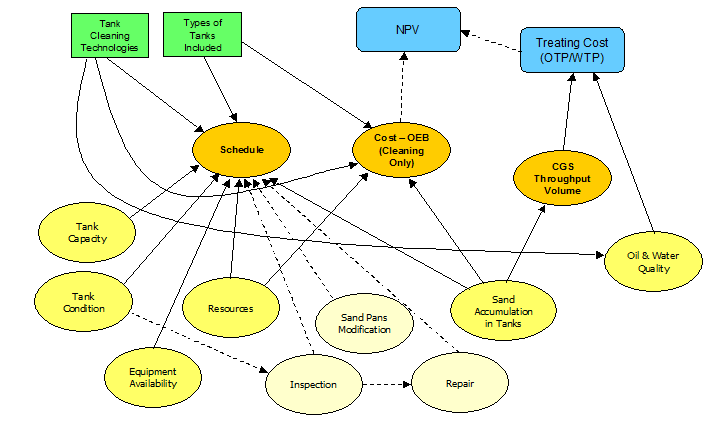 Estimate cost data from various tank cleaning and sludge processing companies. Tank bottom sludge is relatively easier to treat rather than pit sludge (if sludge processing is considered in the scope of tank cleaning work). ­Tank cleaning: $ 20/m3 of sludge. ­Sludge processing: $ 60/m3 of sludge. ­Tank cleaning: $ 25 – 35/m3 of sludge (at maximum $ 35/m3 of sludge). ­Sludge processing: $ 50 – 90/m3 of sludge (at maximum $90/m3 of sludge). Fastest impact on Tank settling and the output of oil and water. Used as data reference for the next phase of development. This entry was posted in Candra Nugraha, Week #6. Bookmark the permalink. Hmmmmmm, Pak Candra…… While you did an OUTSTANDING job in selecting a very real problem and solving it using a structured and rational approach, I am curious why you didn’t perform a more robust analysis, by using “better” or “more appropriate” tools/techniques in your analysis? It appears to me like the decision was made without really quantifying it very well? Keep up the good work, as you are clearly on the right track, but as we progress, I am looking for more sophistication in your use of the tools/techniques.